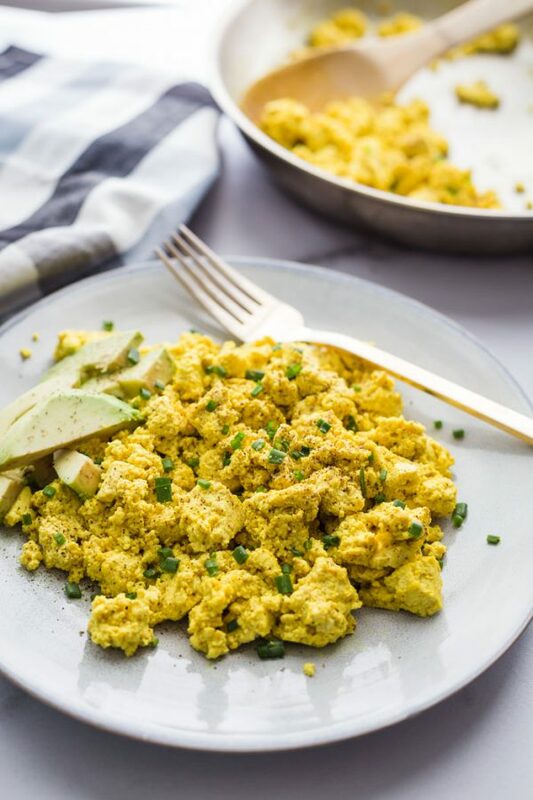 This Easy Tofu Scramble is quick to throw together and such a fun and delicious breakfast for the tofu lovers of the world! Oh hey, Monday! Nice seeing your face again. We’re on to another tofu recipe this week (can you tell that I’m on a huge tofu kick right now!?). 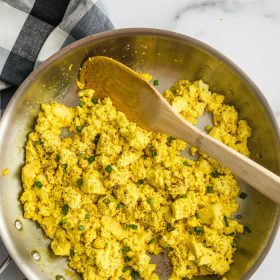 This time it’s an EASY Tofu Scramble! 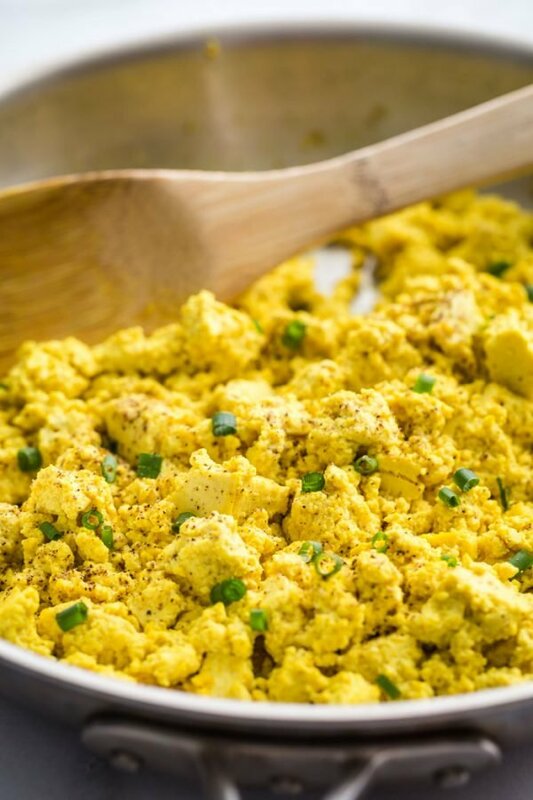 Have you ever tried a tofu scramble? If you’re not a big fan of tofu then maybe you just want to move on until the next recipe. 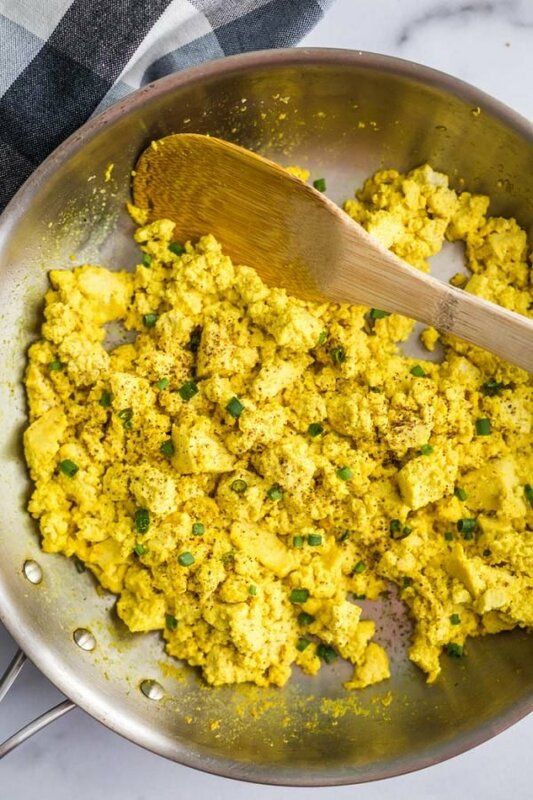 BUT if you are a lover of tofu, like moi, you NEED to try this scramble out. It looks crazy similar to scramble eggs but I won’t pretend that it was the same taste at all. The texture of this scramble is similar to a more dry scrambled egg but the flavor isn’t close. “Why is it yellow! 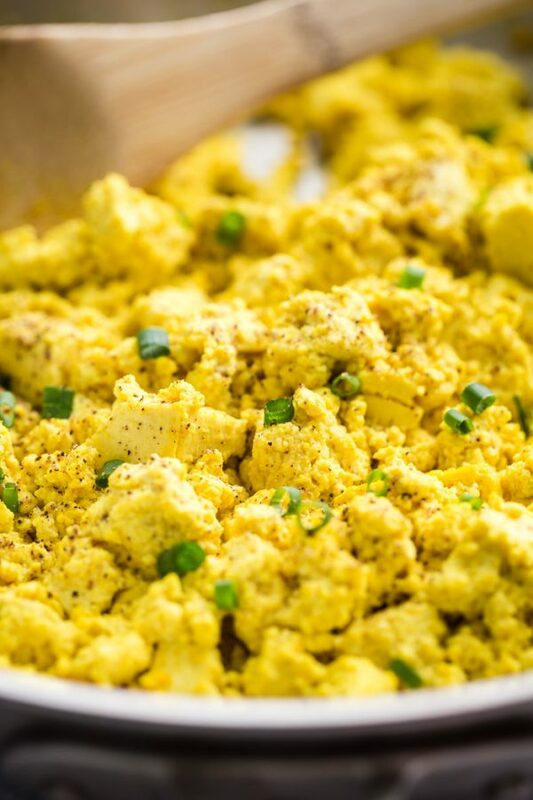 ?” was my first question the first time that I ever encountered a tofu scramble. I’ve seen people add mustard and other yellow things to their scramble to get that color. I went the extra easy route and just added about a 1/4 teaspoon of turmeric powder to mine. It’s virtually tasteless, gives the tofu that fun egg-y color, AND it’s good for you (at least that is what all of the food trend-setters are telling me these days)! I have lots of fun recipes planned with the tofu scramble in the coming months. Think- vegan breakfast burritoes, veggie hashes, etc. GET EXCITED! Start by drying your tofu off as best you can. You do not need to press it like we did with THIS tofu recipe but I like to remove as much moisture from the outside as possible. Then break your tofu into large chunks. A lot of times I see recipes that call for you to break it into small pieces but what I have found is that the tofu breaks up a decent bit while you are cooking it so you don’t want to already start with really small pieces. I break my chunks into about 1 1/2 inch pieces which will then get broken down a decent chunk more from the stirring in the pan. The tofu chunks then get added into a hot skillet with a little olive oil. Turmeric, garlic powder, onion powder and salt & pepper are then mixed in. The tofu is sauteed for about 8 minutes to warm through. The chunks of tofu will naturally break up a bit more while you’re stirring it which is fine. Once done, take off of the heat and ENJOY! Super simple and so good! Remove the block of tofu from the container and discard the liquid. You don’t need to press the tofu for a long time but pat it dry really god with a towel or paper towels to dry off the outside. Break the tofu into large chunks that are about 1 1/2 inches big (very roughly). The tofu will break up more in the pan so I like to start with larger chunks. In a large skillet, heat the olive oil over medium heat. Add in the tofu chunks and remaining ingredients. Stir to combine and continue to cook for about 8 minutes. You want the tofu to be completely warmed through and broken up a bit more. Remove from heat and ENJOY! I like to eat mine with toast and avocado as well as a little hot sauce. I LOVE tofu scramble! I always start with frozen defrosted tofu since it’s so easy to squeeze out the excess liquid and it gets a nice chewy texture to it. And my scramble always includes a ton of nutritional yeast! I love the stuff and that turns it a bit yellow. I’ve never even thought about adding nutritional yeast! Sounds amazing!